Here are some ideas for how to mulch more effectively while spending less! In the fall, just leave this mulch in place, even after you rip out your frost-felled veggies. The grass and newspaper will break down, feeding the soil. Work the remnants into the soil in spring, pulling out any big chunks that haven't broken down. I avoid colored mulches because personally I think they look kinda artificial. Also, the colorant tends to bleed onto sidewalks and drives. Also, in Iowa, avoid rock and gravel. They're a mess to remove down the road and most Iowa plants don't appreciate them (unlike plants in the Southwest). Gravel and rock just makes the plants hot and don't feed the soil the way biodegradable mulch does. One other mulch to avoid: Freshly shredded wood. As it breaks down, it robs soils of nutrients and can actually stunt plants. So let it set for a year or so before using it as a mulch. 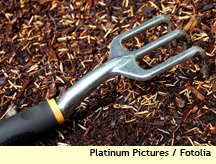 Spread mulch in beds and borders 1-3 inches thick. If you have permanent plantings, such as trees and shrubs, you can first lay down black porous landscape fabric (not plain black plastic--it doesn't allow water through) for even better weed control. Note: If you've mulched before around your beds and borders, each spring, just top it off here and there, where needed.